I just wrapped one of the most demanding, challenging and gratifying months of my life. My April was spent in Florida shooting Fox Hunt Drive, a feature produced by production company REBL HQ. I had the most wonderful crew, director and co-star a girl could ask for. Excited for the final product, but right now I’m basking in my gratitude for the experience. 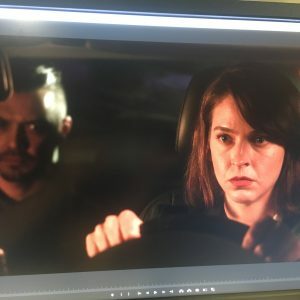 I play Alison Meyers, a down-on-her-luck rideshare driver who picks up a dark and dangerous passenger. Lots of fun things happen. Then there’s a twist. There were so many exciting things that I did on this shoot- I want to blab about them all, but I’m not allowed to give away too much! So… Fox Hunt Drive. Trailer Coming Soon.